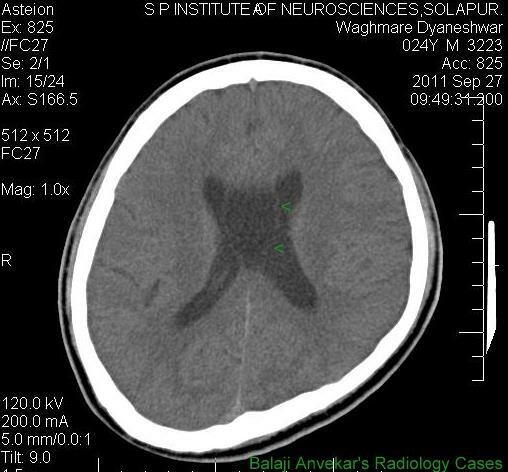 The septum pellucidum is a normal thin vertical membrane that connects the corpus callosum to the columns of the fornix and separates the lateral ventricles. The septum has right and left leaves, each of which is part of the respective medial hemispheric border. 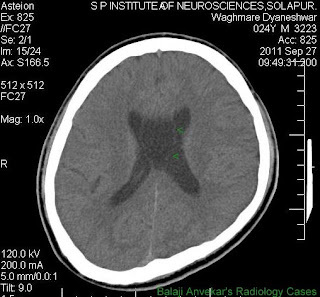 Cavum Septum Pellucidum (CSP) when the septum pellucidum has a separation between its two leaflets (septal laminae) forming a mid line box shaped cavity, bounded anteriorly by the genu of the corpus callosum; superiorly by the body of the corpus callosum; posteriorly by the anterior limb and pillars of the fornix; inferiorly by the anterior commissure and the rostrum of the corpus callosum; and laterally by the leaflets of the septum pellucidum; contains cerebrospinal fluid (CSF) that filters from the ventricles through the septal laminae. Cavum Verge (CV) is the name given to the same cavum septi pellucidum when it extends posteriorly, posterior to the columns of the fornix and communicating with the actual cavum septi pellucidum. In the early literature, these cavities were considered to be the fifth and sixth cerebral ventricles, respectively. They are not actually ventricles because they are not primarily part of the ventricular system, are not lined by cells of the ependyma, and do not contain choroid plexus. The midline cavities are essentially temporary embryonic structures that involute during late pregnancy and infancy. Progressive decrease in width of the cavities during pregnancy and infancy parallels transverse growth of the cerebral hemispheres and in this regard may be seen as the mirror of increased brain size. Persistence of these structures beyond this period does not cause any symptoms but is statistically related to other malformations and psychiatric disturbances, mainly dependent on size. The size of these persistent midline cavities measured either by antero-posterior extent or by width of cavity. Antero-posterior extent measurement is generally used in MR studies of neuropsychiatric populations like schizophrenia (Nopoulos et al 1997). The cava septi pellucidi and vergae are seen as part of normal development in the fetus and neonate. Persistence of these structures is common through infancy. Typically, at 6 months gestation, the posterior half of the fusion is complete. The anterior half does not fuse until after birth, making the incidence of cavum septi pellucidi in premature infants 100% (Larroche and Baudey 1961). Generally, by 6 months of age, the process is complete (Nakano et al 1981), but the fusion is frequently not 100%, as there is often a small cavity near the genu of the corpus callosum (Shaw and Alvord 1969). The reported incidence of cavum septi pellucidi in normal adults varies enormously from 0.10% to 85% (Nopoulos et al 1997). Such disparity in prevalence may contribute to the uncertainty regarding the pathologic implications of cavum septi pellucidi. Another uncommon triangular shaped mid line cavity, known as the cavum veli interpositum needs just mention here, is part of the leptomeningeal space and intervenes between the roof of the third ventricle and the body of the fornices.